One of the most remarkable renewals brought by the Reformation was a shift in the whole idea of what it meant to be worthy and do good. The very purpose of life was redirected. Preoccupation with acquired virtue and earned status was displaced by confidence in friendship freely received and permanently guaranteed by God’s unearned love. The revolution in Christian ethics, like so much else in the Reformation, may be seen as an indirect result of the return to the Scriptures. Even before the Reformers, many common people had the intuitive feeling that the medieval Church had set up its own system of hoops, which you had to jump through to merit eternal reward. The traditional approach to life, spelled out in the official canons, was removed from the joyful spontaneity that one could recover through renewed focus on the spirit of Jesus in the Gospels. The Reformers found it tragically unchristian that the Roman Church should have contrived to manipulate people’s conscience using a kind of balance sheet of earned “merits. ” The religious establishment had been less than honest in leaving lay people with the superstition that God keeps score on your pious activities: as you light a votive candle, venture forth to venerate the relics of some saint, subsidize a mass, or contribute to a building fund. One could even receive papers in connection with certain special donations ( “indulgences, ” they were called), which went so far as to list the amount of remission your gift would merit towards early parole from purgatory. Luther’s indignation, as a loyal churchman, over such huckstering of grace was what had sparked the Reformation in the first place. In the Scriptures there was no basis for this focus on externals. If men by their virtue could accomplish the Law, it would be said to them, get to work. But on the contrary, it is said, relax, rest, in order that God might do the job. Law then could well be impossible, indeed, so far as we are concerned; but it is possible for God to print it in our hearts and govern us by his Holy Spirit—so that it will be an easy and light yoke for us and there will be no harshness in it to trouble us. Calvin was trained as a lawyer, not a monk or clergyman, and this, together with his rather French genius for cutting through to essentials, equipped him to discern the far-reaching implications of these theological insights for the practical business of living. Such a shift in the grasp of God’s purpose for life required that many medieval assumptions be put to rest: all pretensions to laying siege on heaven and scaling its walls, all claims to special spirituality, all posturing on precarious ladders of personal achievement and virtue; all thought of God as a reluctant scout-master who sees our worth in a chest full of merit badges. The whole penitential system, through which the Church had managed to pull the strings of power, had to go. We can see the Church’s paganized approach allegorized in medieval woodcuts or paintings. There is poor Everyman struggling painfully up a ladder of acquired virtues and earned merit, hanging on precariously above the yawning jaws of a fiery Hell. The Church may spur him onwards by fanning the flames, as it were, with its warnings, by arranging an occasional boost from the Saints, who have made it already, or by passing along encouragement and merit on loan from Jesus’ own winnings. But all the while, way up where the ladder reaches heaven, an impassive God the Father sits by with baleful eye and folded arms. For he knew the dangers: If you forget that “faith alone ” means faith in someone definite, then you may deceive yourself into treating your own whims or passions as if they were the inspiration received through “faith alone. ” This was the “libertine ” or “frenetic ” trait Calvin decried among some Anabaptists. He knew it would give a black eye to the whole Reformation. Indeed, at the very beginning of his career he had been driven into exile by allegations of looseness in practical life. He fled Paris for the freer cities of Navarre and Switzerland, accused of sedition against the established order. No one knew better than an ex-lawyer the need to clarify how the new grasp of faith would bring real order to life. This is why Calvin prefaced his great lifework, the Institutes of the Christian Religion with an open letter to the French king. He wanted to reassure the powers-that-be that a return to the early Christian sources and grace-responsive life would motivate a more orderly, loyal, and socially constructive life. 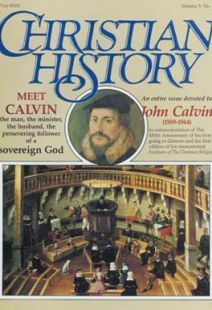 Calvin repeatedly has been misunderstood as one who sought after a new legalism, more bitter and humorless than any canon law. But Calvin saw very clearly that it was a state of personal relationship, and not the outer form of action that was the heart of the matter for human goodness. Two of Calvin’s favorite slogans carried particular revolutionary force for the Christian life. First, Calvin claimed that “the principal work of the Spirit ” is faith. A second, closely related slogan is similar in form: “the principal exercise of faith is prayer. ” Grasp all that is intended under these two statements, and we have the Reformer’s key to the entire Christian life. If bonding free persons into his community is God’s very goal for all creation, then the trust relationship we call faith is his principal work. This is a point where the Calvinist tradition and later Anabaptist and Pietist churches could have found themselves much closer together than they actually have been in the push and shove of later history. At the very center of Calvin’s thought, piety is tied intimately to Christian behavior and social action. These two dimensions of Christian life made one seamless garment. “Of prayer: which is the principal exercise of faith, and by which we daily receive God’s benefits ” is the heading of the longest and perhaps the most important chapter regarding Christians’ behavior in Calvin’s main work (Book 3, Chapter 20 of the Institutes). “Prayer, [the] principal exercise of faith ”—the words may pass us by as all too glib. Like a pat on the head: “Be good little children, now, and say your prayers. ” But this was no pious chant for Calvin. Faith for him was a life and death matter, not only spiritually and psychologically, but in the political arena as well. Fighting words, they resulted from long struggle for the essentials of biblically reformed life. The phrase contains a double meaning. Prayer first provides, as it were, a workout for faith. Prayer is the action whereby faith is strengthened and reinforced, as muscles are toned by exercise. But the other meaning of “principal exercise ” or “principal practice ” may surprise us. With the gusto of a revolutionary, Calvin is declaring that the whole pious enterprise of the medieval penitential system dwindles behind this simple communion. Prayer, our first line of spontaneous personal responsiveness to God, is the principal action as Christian believers. Prayer is the very substance of good action. Calvin could scarcely have put it more strongly. But why this stress on prayer at the center as the “principal practice of piety ”? Grasp the movement of his thought here, and we have the Reformer’s whole ethic in a nutshell. No goodness can be accomplished by a person in isolation from God’s living community. No action, however dutiful, no virtue, however shining, can even approach actual goodness before God, unless it expresses conscious relationship with him and is imbued with a sense of gratitude for everything as his gift. God’s whole purpose in creating us, in adorning the world with such a magnificent variety of beautiful and good things, in watching over us with such careful providence is that we might be moved continually to render praise to him. This kind of sweeping claim has not received its full force in Calvinist history. Taken seriously, this “return of grace ” is not merely one duty among others. It is the very essence of human existence and itself the prime Christian activity. Here we can begin to grasp the true sense of “glorifying ” or “honoring God ” as “man’s chief end ” which is at the very beginning of Calvinist catechisms. “We are born and placed in life in order that we practice God’s honor, ” says Calvin. And thanksgiving, a free response to God’s own gracious giving, is the very essence of what is meant by God’s honor. We honor God if we “put all our confidence in him, ” and acknowledge that all good comes from him alone, as Calvin’s Geneva Catechism has it. For this, and this alone, is the hallmark of a Christian: prayer in the context of thankful expectation. The whole of ethics, then, is comprised under the doctrine of the Holy Spirit. There quite simply is no ethic, no value or good to be had in life outside of the faith-relationship. Calvin took Paul at his word, where he said, “whatever does not proceed from faith is sin ” (Rom. 14:23). This means that for Christians any good deed is recognized as God’s own action—an expression of lively conversation with him. In this perspective the call to “pray without ceasing ” in I Thessalonians 5:17 had a very literal meaning for the Reformer. The entire active life melds into a liturgy of prayer. One thinks here of the little prayer caps worn by Mennonite women, which are meant to signify something similar. Day-long, one prays in everything. Calvin sees the function of even the most demanding Old Testament laws to conduct us beyond their own formal prescriptions and throw us back into conversation with God. God’s Law has a double force. It stands not just as outer command: but, more fundamentally, it acts as sovereign promise of the inner renewal his community receives from him. In a dual way, then, the law has always pointed past itself to grace-dependent relationship and funneled into new prayer response. Calvin had a way of showing how the Lord’s Prayer follows the same outline as the Ten Commandments. Why? Simply this, God’s commands are also his promises. In telling us our need, they teach us what to ask from him, who is the source of all that we have or are. His laws point us both directly and indirectly towards the prayer relationship. But Calvin was also fond of pointing out how “God commands that which we cannot do, in order that we know what we should ask of him. ” Our failures are turned, through prayer, into a deepening fulfillment. “The law commands in order that we, being pressed to keep its commandments and succumbing through our frailty, might train oursleves to implore God’s aid. ” Law acts like the flywheel on a steam engine: its weight drags us through cycles of failure to return to our energy source. So God trumps our failure, as we are drawn back into the grace-dependent relationship which is the Law’s fulfillment. Everything in life, then, is given to reinforce the grace-dependent relationship: our natural joys, through prayers of thanksgiving; our adversities, weakness, and needs, through prayers of petition; our failures and rebellions, through prayers of confession and repentance. As we live our lives in the grace-dependent relationship, Calvin envisioned us as always being able to get our bearings for every new situation by looking at the dimensions of God’s action in and for his community: past, present, and future. Looking back at what God has promised us in Christ, we are relieved from paralyzing compulsions to do everything for ourselves. “Self denial, ” he called it (using a Latin legal term which referred to transfer of the burden of ownership). We are not our own; no need to worry. Self-dispossession, then, did not mean we should repress our own feelings or deny our own worth, but quite the opposite: it meant we may feel our infinite worth as experienced in Christ’s love, as opposed to our own accomplishments. It meant we could let our limited view of self fall away, in favor of an unspeakably higher status: the full, permanent friendship of God. Consideration of the second aspect of God’s relation to his community, here and now, is a question of empowerment. We should be prepared for anything in the present moment. “Cross- bearing, ” as Calvin calls it, is no call to long-faced “inner-worldly asceticism. ” Rather, one is to live in the reassuring company of the One who has been there before us. Christ’s presence and the resurrection promise can lighten all our crosses—both the burden of sharing his love for an unlovely world, and that of our own shortcomings. The future aspect, “meditation of the future life ” is no world rejection, as it has sometimes been misconstrued. Rather, it is living in the promise of world renewal. So everyone and everything we experience may be regarded in anticipation of their perfect re-creation in the Father. With such reflection, the most dismal present scene becomes luminous with hope—hope based on sovereign promise, and not just our human potential. This three-directional tuning in on the God known through Christ gives a kind of navigational orientation for direction- taking in every new situation life brings—however uncharted the waters. Calvin found it summarized in Jesus’ words, “If anyone will come after me, let him deny himself, take up his cross daily, and follow me. ” For the Reformer this meant constant reflection on our fellowship with the one who accompanies us into every decision: as incarnate Word, giving shape for life; as Spirit, sharing, empowering, and preserving our present existence; and as eternal Father, drawing all things, finally, into coherence with his grace. Prayer, for Calvin, is what makes a Christian. It is not just the first act of a Christian in time—though it is that—it is also the foremost thing in Christian existence. Dr. Raymond K. Anderson is Associate Professor of Philosophy and Religion at Wilson College in Chambersburg, Pennsylvania. What did the early leaders of Christianity think about money's role in their lives? Here's a sampling of opinions from the church fathers.